Song, Song, Blue ain’t we glad we got one? ……………………..
Well I am glad we have Song and glad he is available for the visit of The Blues, well, we all know them as The Chavs, but it made the title look ok 😉 What do you mean, it didn’t???? Over the last few games while Alex Song (now tied down until 2015) was just one yellow card from a one match ban, I just dreaded that he would get booked against Sunderland and miss this weekend’s fixture. The man has discipline, many ‘bigger’ players who play for other clubs would not have been able to do what he has done. Maybe the tackles he makes just inside our own half are done on purpose and thats why he gets booked! Regardless, it usually results in any attack being over, threat gone and we are off again. But when the time came to be careful, he was just that. Alex Song is just 22 years old, there are kids where I live older than him, but still they behave like 10 year olds… Alex, I am glad you are settled in your life and settled at Arsenal, one day real soon everyone else will see that too. Cilla Black has arrived at Stamford Bridge with a new version of Surprise Surprise, yep Fat Frank has suddenly reappeared, fit for the game against us on Sunday! No surprise really, I don’t doubt for one minute all their top players will have suddenly recovered just in time.. I don’t care, let’s beat them with their full squad, that way they have no excuses come 6pm Sunday! Kerrea Gilbert has been put up for sale according to the Daily Mirror, hope the lad gets himself a good side to play for and gets to actually play regular football, he is only 22 years old and has a bright future ahead of him. Our reserves took a beating last night at home, well they lost 2-1 to Aston Villa and can you believe Fran Merida got sent off. Maybe he did that on purpose just to remind Arson he is about and wants his contract sorted out. Now he has a game or two out, he will have plenty of time! Good old Theo Walcott has opened his choppers again, this time though is posistive, he says he is over his injury, his knee feels great and he is sharp. He’s also making it known he wants to play in the central role up top rather than on the wing. With all our injuries, the last thing we need is another player who needs surgery. Well, one more will be going under the knife, Armand Traore. Before you start panicking, it won’t be until the end of the season and the surgery is to remove his tattoo’s!! Good, no offence to any of you out there who have them, but I hate them, they look ugly and I just wish Cesc Fabregas would follow Traore to the treatment room. Oh, and David Beckham, I love him, but I am sure he is to blame for the ‘Tattoo Trend’! Not a lot else going on, the Chavs won, The Mancs lost and Rafa could get the boot if Everton beat Liverpool at the weekend – now there’s a thought to make you smile! This entry was posted on Thursday, November 26th, 2009 at 7:55 am and is filed under Uncategorized. You can follow any responses to this entry through the RSS 2.0 feed. You can leave a response, or trackback from your own site. 32 Responses to Song, Song, Blue ain’t we glad we got one? …………………….. I tried to tell Armand that he wasn’t staying at Portsmouth long enough, but would listen? NO, and now he has got to go through all that pain and expense to remove his heart shaped tattoo with “I LOVE PORTSMOUTH” I told him, I did. – he has spent the last 3 years semi-bull****ing that he believes in his players and they can win everything, now this year he really believes it himself and so gets very angry when the players underperform/make silly mistakes. Good Theory…..makes a lot of sense….he has definitely changed that’s for sure…..he is probably getting really fed up himself about not winning anything. I agree, the players are not ‘kids’ any more, certainly not in terms of experience. We must have the greatest number of under 22’s who have made more than 100 appearances for their clubs. What did you think of my question yesterday regarding the formation we should play against the chavs? Although they can play with one up front, Annelka is in the best form of his career at the moment so I can see a sort of 4:4:1:1 from them. They can attack through the midfield or via the long ball. I just feel we have to make our possession count and as well as building up attacks methodically (allowing them to get men behind the ball!!!) we also have to hit them very quickly on the counter. You are going to have to remined me of what your formation was…I think I remember Senderos in there and I think I switched off, probably because I cannot see past Sagna,Gallas,Vermaelen,Silvestre. If your formation involves moving Vermaelen than I cannot agree….for the first time in a long time we have someone that can give Drogba as good as he gives. That’s the point, I couldn’t suggest a formation … we don’t have the options that the chavs do, we only have the personnel available to play one way. There will be no point in high crosses or pumping long balls forward. Only wengerball at its most slick will prevail. I would play a sort of 4:2:4 (4:3:3). I’d like to see Denilson and Song playing in front of them but either one having licence to go forward and an ‘upper attacking midfield’ of AA, Nasri, Cesc and then one of Dudu/Rosicky/Theo/Vela. I think he may not play Denilson as he is still coming back from injury and play EE at RM because for some reason he favours him in these big games and if Diaby magically becomes fit, he will also play. As you say, we don’t really have the options; the back line will be the one we both suggested and I think he will play both Denilson and Song; they are the two guard dogs that sit in front of the back four, also as you suggest, one playing more advanced when the oportunity arrives while the other covers which is exactly what was happening on Tuesday night. Arsharvin is a banker to start as is Eduardo, after that I would prefer Walcott but I wouldn’t be disappointed if he played Nasri. I hope that Wenger waits to play Diaby against City in the CC but then again his height would be useful against the Chavs. I cannot see Vela playing, perhaps on the bench with Rosicky. I’m not optimistic about Sunday, we will, as you say, have to play the best Wengerball that we have played in a long time in order to win but I just don’t think that the front line have had enough time to get used to each other for that to happen. It seems we are in total agreement. Sadly I think that a point from sunday would be a decent result for us bearing in mind current form and the personnel we have available. I hate to say it, but we try to emulate the spirit pool performed displayed against manure when they had the cards similarly stacked against them. I suspect he will start with Nasri instead of Walcott, with Walcott coming off the bench with 20 minutes to go. I am not feeling very confident about Sunday, remember what they did to us the last time they visited! I see Arsene has said that Gallas’ eye is so swollen he can’t get his contact lens in 😦 he’s not guaranteed to be fit for sunday ….. The war of words has started before the game and Annelka is acting as though we did the dirty on him instead of him thinking the grass was greener elsewhere – oh and his brother made a pile of money out of the transfer! Oh, and is this the same Anelka that shouted from the roof tops in the summer about how he should never have left us? I read earlier that Clichy may be back for Sunday, have you heard anything? No rico – I find it hard to believe! I’m not aware that he has played any warm-up games as would be the norm……. Hi Freire, you would appreciate the sunshine if you had had the weather the UK has had for the last month, gale force winds, torrential rain with flooding!! Oh to see the sunshine!! Let’s change, then, Rico. I go to England and you come to Brazil. You stay here for one month, and I stay there for one month as well. You won’t support the brazilian sun … I love cold and rainy weather! * You’ll hear our ‘samba’ and you’ll watch the worst football league you’ve ever seen … always under the brazilian-sun … more than 30 degrees , isn’t it the description of Hell? 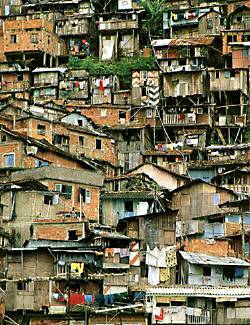 This is a favela. Wanna see more? LOL. And well…it’s going to be difficult to watch our boys, cuz TV here shows Mancs and Barça, only. well, off to study. Cya all.